Must-see hot events held in Tohoku for August, 2017 brought to you by MagicalTrip staff. We highlight the best events for anyone visiting Tohoku in August, 2017 and wondering what to do. Plan a trip around the various traditional events held in Tohoku in August, 2017. Goshogawara Firework Festival” is composed of various sizes of starmines. It is held in the Goshogawara city, in Aomori prefecture. It is on the central part of the Tsugaru plain, located in the central southern part of the Tsugaru peninsula. The name Goshogawara is originated from the fact that there were five wide kawara. The Goshogawara Firework festival is a historical festival of “water, light and sound” that is held the 68th time this year. Starmine, musical fireworks, the No.4 balls will be launched while synchronizing with the uptempo BGM, and the place will be surrounded by cheers of the audience. The finalle consists of 300m wide starmine, lit up 80m wide water curtains; the collaboration of water, fireworks and music is a must-see. 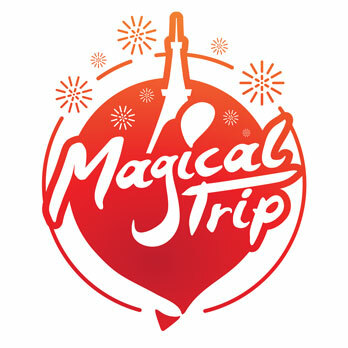 It is necessary to purchase tickets and make a reservation in advance. Please inquire whether there is a ticket stock. Oga Nihonkai Firework festival will be held at the OGA Marine Part at the venue, where about 10,000 fireworks will be launched. Oga is located in the western part of Akita Prefecture; it is said that the name of Oga is stated in the Nihon Shoki, and a burden (oga) became an ogre (oga). In this festival, the volunteers are those who are related to Oga and those who love Oga; it is relatively a young festival as it is the 15th time this year in order to wish for Oga’s vitality. In 2017,the theme will be “Stars on stage – A Midsummer Night’s Battle” with No.10 balls at the biggest, starmines and water starmines, and message fireworks with the collaboration of musical and lights. Fireworks of Daikyoku collaborated with a someone who received many awards for fireworks and an MC; the one hour and half minute long programme has an original story and high quality performances of fireworks. On the day, the messages of fireworks sent to important people along with the photo contest is the unique viewing point of this festival. Every year, the audience is pumped up since the message fireworks are used for proposals too. Although you can purchase the ticket on the day, it is recommended to purchase in advance as congestion is expected. Please inquire whether there is a ticket stock. 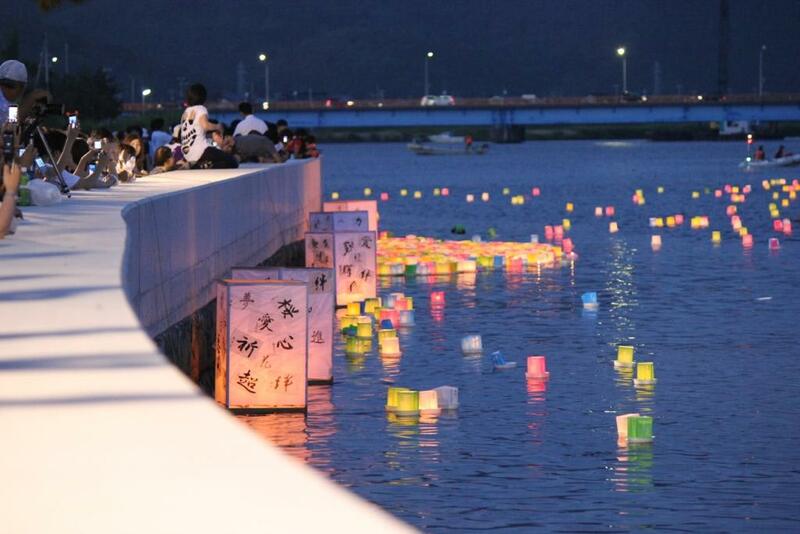 The festival dedicated to the gratitude to Hokujo River that flows through Ishinomaki river bank will be held. The river opening festival is a festival that is appreciated for the grace of the river, and moreover the sanctification of the ancestors. On July 31st thanks to Kawamura Magobei to the built of foundation of the development of Ishinomaki, a memorial to the spirits, a dedication for those who passed away in the 311 Earthquake in Japan as well as the lanterns lit on rivers will be held on the Hokujo River. On August 1st, various parades such as the “Mikoshi parade” “Primary school students drum parades” “Omatsuri Area” will he held along with the main event, Magobee boat race that will be held in the Hokujo River. The atheletes will aim for victory as they row the boat, the cheers will be raised from the audiences from the riverbank. There will also be fireworks in the finale at night with jumbo starmines and illusion starmines. This festival has more than 30 thousand people every ear, and the launching place is set aside from the Haguo Bridge and the Mikawa Bridge that goes through Akagawa River of the Tsuruoka city. 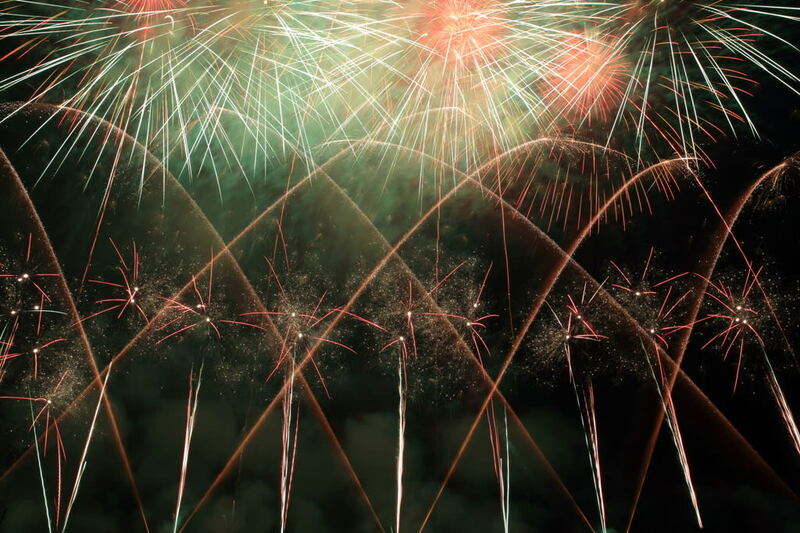 It is also a competition between firework craftsman for the “Nationwide Firework Design Competition”. They entered the top 10 in the “100 Selection of Japanese Fireworks” and is rated as the best fireworks in Japan, and fans come from all over the country each year. Fireworks have the launching width of max 700 m. It makes full use of the Akagawa Riverside, and is an original competition that you can’t see anywhere else. In the mass seats you will have to look directly up for its powerfulness; the finale is especially a must-see. Numazawa Water Festival is an annual festival in Kanayama town that is nown for the village of spirits and the big snake. 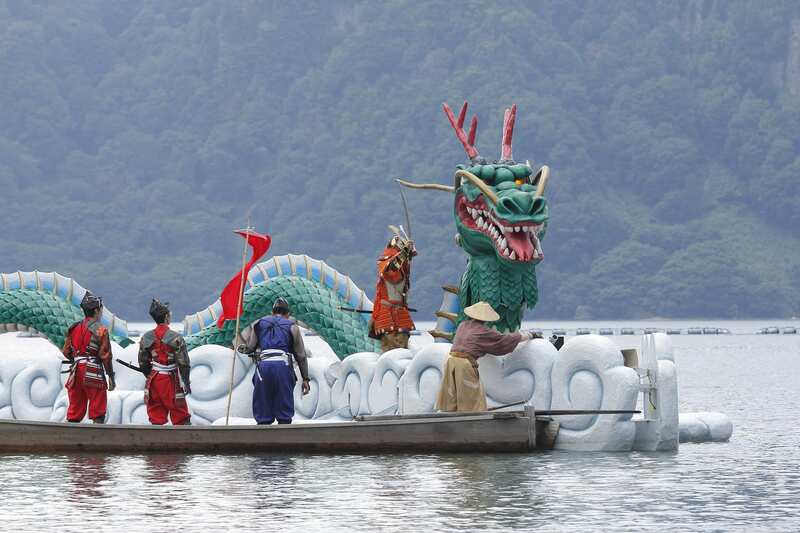 It is held at the Numazawa lake where the legend of the serpent is told, and is loved by those who worship the serpent. On the first day there are nature experiences like water games, ikada race, fish grabbing, and stage performance and floating lanterns. At night, there will be starming fireworks launched on the lake. As the Kanayama town is known for its legend of the serpent, there will be mystical Niagara and water starmine fireworks, which is a must-see of this festival. On the second day, there will be character shows, stage performance, and the serpent extermination as the main event while arts of those era will be reproduced as well. Fukuyama Dream Firework Festival is a hand crafted summer festival that is organized mainly by the Youth League of The Society of Commerce and Industry that is held at the Fukuyama riverbed multipurpose venue. There will be a festival called “”Children’s Festival”” that will be held along with Bingo and fast drink competition, hula dance, and lottery etc. If you come in a yukata you will receive one raffle ticket, and if you come as a couple wearing yukatas you will receive three. There will be stalls lining up, and is usually crowded with families. 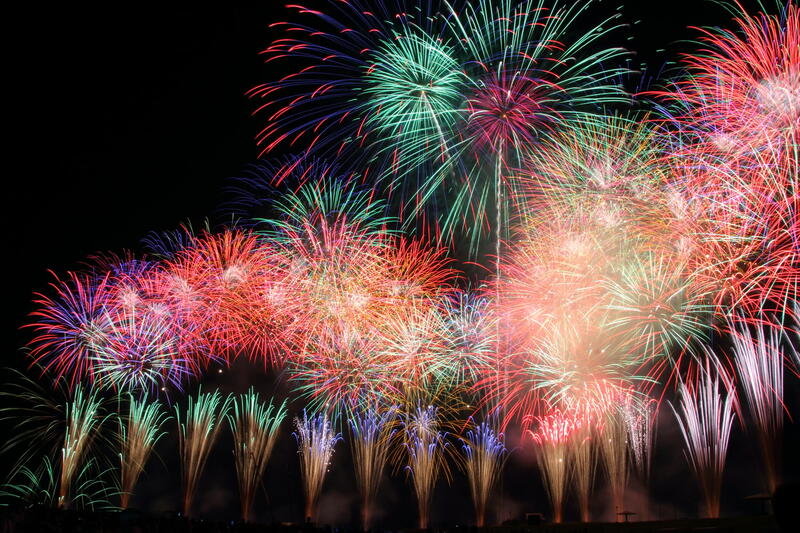 The finale of the festival will be decorated with fireworks, and the huge fireworks launched on the sky of Abukuma River attracts the spectators every year. You must see the starmine and twin flowers, musical fireworks, and the huge fireworks along with the shaku balls which will be launched for an hour. “Atsumi Onsen Asaichi” has a history over 260 years and is held at Tsuruoka city, Atsumi. Atsumi onsen is famous for its mild hot spring and the relaxing sound of the streaming water. They also serve dishes cooked with good quality seasonal ingrediets along with the hotspring and their warm hospitality. During the events, there will be various items such as agricultural products like red burns, fishery processed products and souveniers that are arranged in the morning market place which will definetely entertain you. 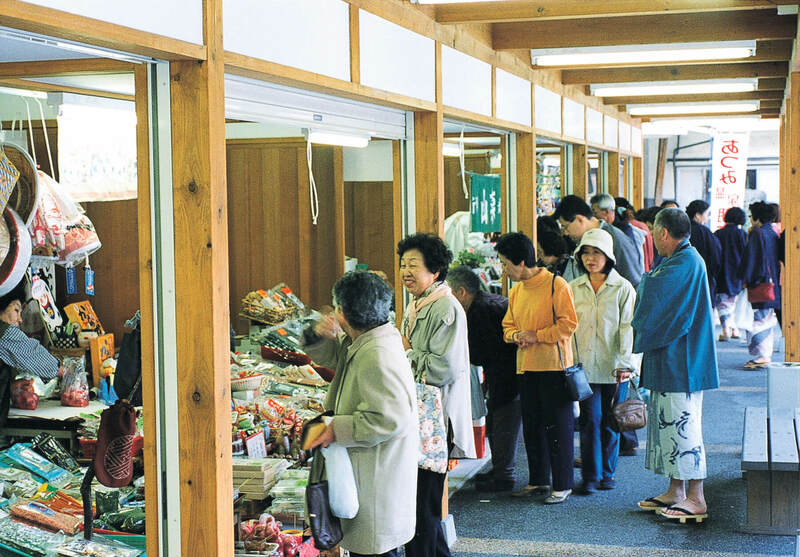 As it is a hot spring district, you can stroll around the morning market in yukata and geta while enjoying the calls called “Aba” between the customers and salesgirls.